This compact 125-piece first aid kit meets OSHA requirements for a 25 employee job site or office. 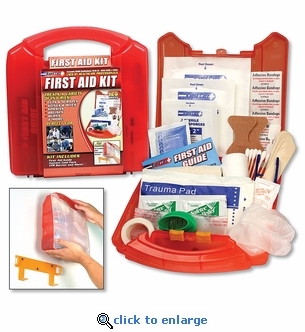 The kit contains an assortment of first aid items to quickly treat minor injuries on the job. All items are packaged in a clearly marked wall-mountable plastic case with handle. Meets ANSI Z308.1 Standard. 20 Adhesive Bandage 3/4" x 3"
20 Adhesive Bandage 1" x 3"
Packaged in a Hard Plastic Case with Handle.